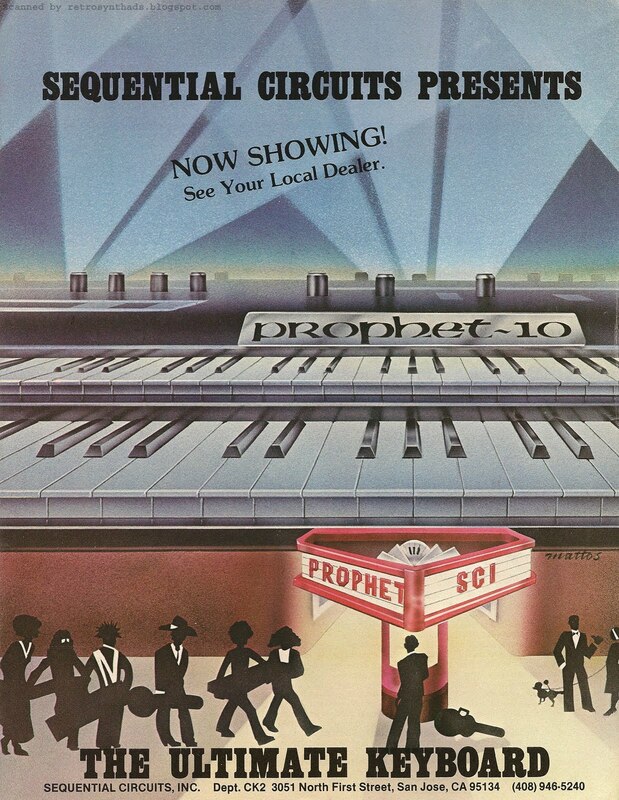 Sequential Circuits Inc. Prophet-10 "The Ultimate Keyboard" advertisement from page 10 in Contemporary Keyboard December 1980. What the...?!?! Ewwww. Not pretty! Not pretty! 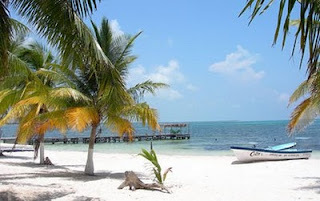 Mattos - come back! When I first saw this ad, I thought maybe it was the some ugly duckling from SCI's past. 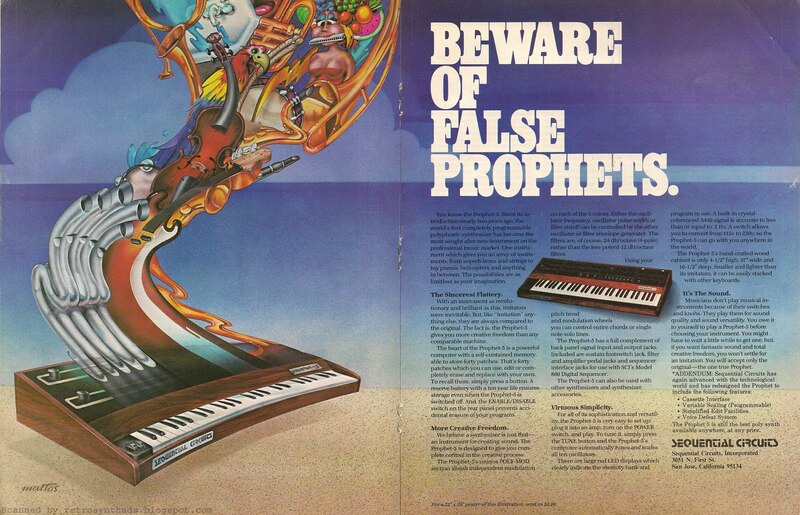 Like, from back in 1978 when this similarly ugly early Prophet-5 advertisement found its way in CK magazine. But, in fact, it is not. 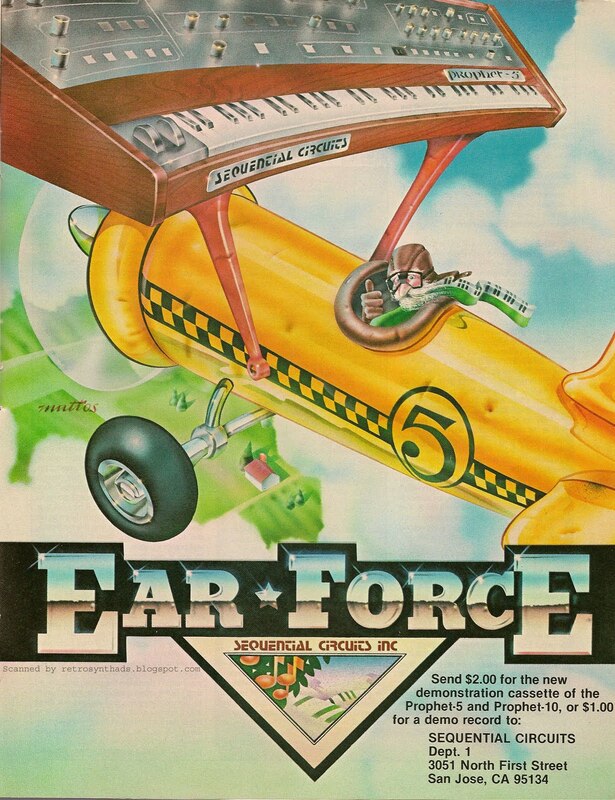 This advertisement appeared in Keyboard in late 1980. So, why run a really awesome Mattos-based ad, then switch to a boring black and white ad with absolutely NO design, and then wait half a year to run a new Mattos-based ad? My guess? SCI had needed to get the word out on the specs of this awesome beast of a synth. As great as those previous Mattos ads were, they didn't tell readers *anything* about the instrument itself. Still, replacing that "Theatre" ad with this ugly thing breaks my design heart a little bit. I'm surprised that SCI didn't have any budget money to spice it up at all. Although - they did keep one aspect of the earlier ad - the "Ultimate Keyboard" tag-line (it appeared at the bottom of the "Theatre" ad, and then at the top of this ad). But as ugly as that ad is, I'm still drawn to it because it contains so much technical info on the Prophet-10 - and as you'll see below, it is also a symbol of SCI's determination to get this beast to market. As mentioned, the ad is a treasure chest of reference material that readers of CK were most likely waiting a long time to get their hands on. I say that because the only other real info I can find in CK on the Prophet-10 dates back to July 1979 from the Spec Sheet section. And that was probably when SCI anticipated the release of the Rev. 2 Prophet-10, that according to synthmuseum.com's Prophet-10 page was dropped after the first three prototypes were made. So, CK gear-junkies had been waiting over a year to hear more about the Prophet-10. "Sequential Circuits Polyphonic Synthesizer. The Prophet 10 is a dual-manual (5-octaves each manual) ten-voice synthesizer with 32 user-writable programs available on each keyboard. Extra programs can be stored on cassette tapes. An optional five-voice polyphonic sequencer is also available with a built-in cassette interface for storing sequences. It operates on the bottom keyboard and can be retrofitted into units purchased without the sequencer to begin with. Other features include pitch-bed and modulation wheels, octave transposition switches, assignable voice modes (you can set how many notes you play on each keyboard; you can also control two separate tone colors from the same keyboard), voice-assignment LED indicators to let you know which voice is being triggered at any given time, automatic tuning, programmable volume control, a program increment footswitch, three-band programmable equalization on each keyboard, two assignable and programmable control voltage pedals which can act on each keyboard in the same or different ways, depending on how you program them, two oscillators per voice, ADSR envelope generators, polyphonic modulation section, upper and lower keyboard balance control, an A-440 reference tone, stereo unbalanced and balanced outputs (for separate amping of upper and lower keyboards), and a mono unbalanced and balanced output. Sequential Circuits, 1172G, Aster Avenue, Sunnyvale, CA 94086." And as the saying goes - when it rain, it pours. This information-packed advertisement ran in October and December 1980, and then just a month later in January 1981, CK published Dominic Milano's Prophet-10 Keyboard Report. That write-up finally provided readers with all the Prophet-10 info they would ever need, and the introduction is especially juicy because it provided readers (and me!) with a lot more history on exactly what happened with the Rev.1 Prophet-10's overheating issue. "In January 1977, Sequential Circuits brought out a polyphonic synthesizer called the Prophet, which was initially available in two models, a 5-voice and a 10-voice. The two models were identical except that one of them let you play up to five notes at once and the other let you play as many as ten. The Prophet's voices were homogenous - that is, only one tone color was available at a time - and each voice consisted of two VCOs, a resonant 24dB/octave lowpass filer with an ADSR envelope generator, and a VCA with another ADSR. These circuits were tied in to a Zilog Z-80 microprocessor which was programmed to remember voltage values and could therefore store complete patches in its computer-type memory. The Prophet-5 became one of the success stories of the synthesizer industry, but the original Prophet-10 was quickly withdrawn from the market. Despite the fact that much of the circuitry was in microchip form, too much electronics had been crammed into too small a space to allow for adequate heat dissipation, so the oscillators weren't very stable. Only a handful of units were shipped before the 10-voice was discontinued." So, what we have here is a great example Sequential Circuits' drive and determination. After the failure of the Rev. 1 because of heat dissipation, and the drop of the Rev. 2 prototypes when the switch from SSM chips to CEM chips was made, SCI kept at it. Okay, my John Mattos infatuation is coming to a close. But, before I put it to bed, I thought that since he was, in my humble opinion, responsible for some of the most juicy, well-remembered synthesizer ads of the late 70s/early 80s, I would provide a few more yummy nuggets of Mattos info that I came across a while back. And, who better to relay this info, but SCI themselves, through a short article that appeared in the February 1982 issue of Sequential Circuit's newsletter/magazine called "The Patch" (Volume 2, Number 1). The half page write-up appeared at the top of page 12 (the last page) of the newsletter, and gave readers an excellent introduction to John. In addition, the article contains some wonderful historical reference information and is a must-read for hoarders of SCI promotional material, John Mattos' work, and heck, synthesizer historical information in general. "Can I get posters?" "Who does all your stuff? It's terrific!" John Mattos does our "stuff," and we think it's pretty terrific, too. At 28, John is a phenomenal air brush artist whose works have drawn critical acclaim from the Western Art Directors Club and the Art Directors Club of New York. Born in Modesto, John's first interests included horseback riding and music as well as art. At thirteen, he received his first award for art (a blue ribbon) at the Stanislaus County Fair, where he also won an award for equestrian dressage! Music captured his attention in high school and he played a Vox "Phantom" guitar with a group that performed at every prom from Stockton to Merced. "The band was popular because we knew the long version of 'Sunshine of Your Love,' and the real verses to 'Louise, Louie'!" After high school, John majored in illustration at the Art Center College in Los Angeles and received his degree in 1975. His first "real" commission came from A&M Records for an insert in Rick Wakeman's album, "The Myths and Legends of King Arthur." John traveled in Europe for the next two years and worked as an illustrator in Paris. "I drew black and white rapidiograph (technical ink pen) pictures of men shaking hands, women in front of refrigerators, platters of food, grinning men with fistfuls of French money; horrible work but it prolonged my stay - two years of no air brush." In 1978, John returned to California and took up residence in Palo Alto as a free lance artist. The Blank Design Group, then representing SCI, commissioned him to portray a multitude of sounds rising from a new instrument called a Prophet-5. This advertisement was entitled "Beware of False Prophets," which was later combined with gold lettering to become the "Earotic poster". John's next assignment was the Sphinx ad, "A Legend in its Own Time." This piece and all subsequent artwork has been commissioned directly by Sequential Circuits, and has appeared in Contemporary Keyboard, Musician Player and Listener, International Musician and Recording World, Music & Sound Output, Sound Arts, as well as SCI publications in the form of posters, decals, literature folders, and Christmas cards. John's biggest contribution to SCI has been the personification of the Prophet synthesizers in the form of the Prophet Man. 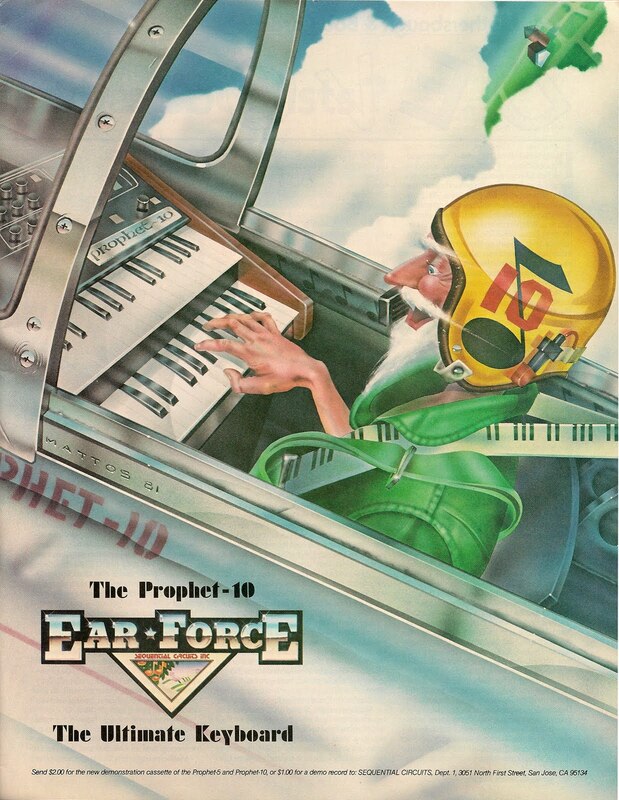 Originally seated on his "throne" ("The Prophet delivers" poster), the Prophet Man has taken off (reflecting the success of the instruments he represents) and has flown a bi-plane, a turbo-jet, and a rocket plane in the "Ear * Force" campaign. 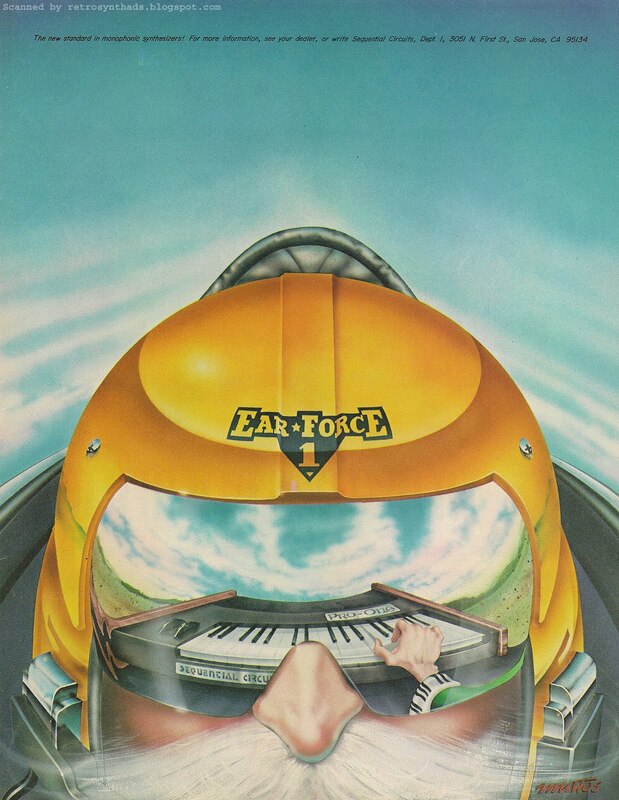 In 1982, we'll be launching him into space for some Extra Vehicular Activity with a Remote keyboard!" Where do I begin? So much historical reference info! Well, for starters, this article confirmed my research that the "Beware of False Prophets" and Legend In Its Own Time" artwork were among the first ads to be created by John. I initially couldn't find any info on the "The Prophet Delivers" poster also mentioned above, but then remembered the SCI merchandise ad that included a lovely gal wearing "The Prophet Jersey". Look at that image (bottom right corner of the ad) for what is probably the image from the poster. And, how about that reference to Rick Wakeman's "King Arthur" album. A quick Google Images search brought up the album page on the Audio Preservation Fund Web site, which includes some high resolution images of the inserts. A quick scan of the images didn't bring up the identifiable Mattos signature that can be found on his SCI artwork, but gatefold 1 and 2 (which make up one larger image) in particular looks fairly Mattos-ish. Especially the clouds. But, I could be totally off-base there. Just thinking out loud. But, what I'm most interested in is the reference to Mattos artwork that was included in Christmas cards. Does anyone know anything about these cards? Copies? Scans? Anything? Seriously. I have never heard of these cards, and would love to see a sample. One last thing. I thought I would also mention that you can view more of John Mattos' artwork on his Web site. Some great stuff there. Also, I have created two new labels - one for MATTOS, and one for ARTWORK, so you can see even more great artwork done for SCI, Octave, Korg, and ARP. 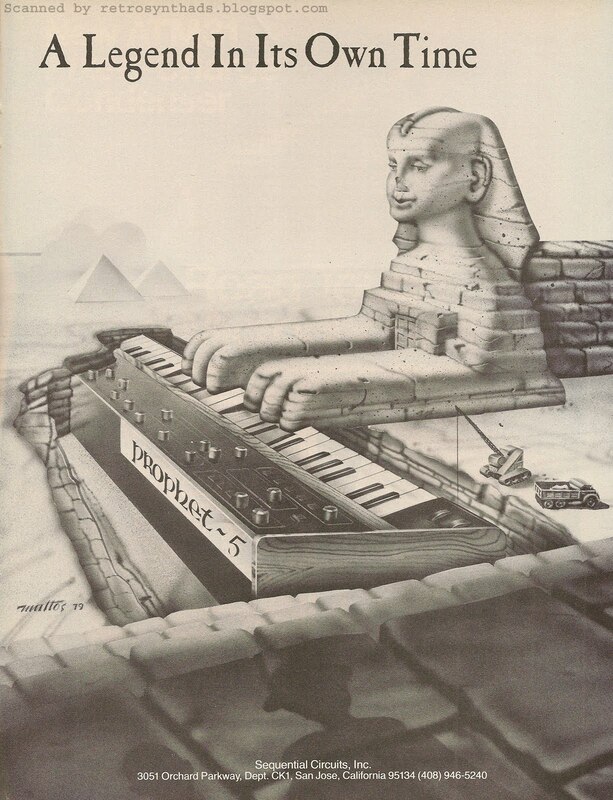 Sequential Circuits Inc. Prophet-10 "Sequential Circuits Presents The Ultimate Keyboard" advertisement from page 31 in Contemporary Keyboard Magazine, September 1980. That's right. This is the third Sequential Circuits advertisement to feature the artwork of John Mattos, and SCI had to know they were on a role. You could probably hear the high-fives making their way around the SCI offices when this ad first appeared in the February 1980 issue of Contemporary Keyboard, following closely on the heals of the ever-so-popular Prophet-5 "Beware of False Prophets" ad that first appeared in November '79, and the "Legend In Its Own Time" ad in January '80. This ad has a lot in common with the "Beware of False Prophets ad". For example, this Prophet-10 Mattos ad wasn't the first ad for the Prophet-10 - but definitely a step up. And this ad was also modified slightly during its ad-run. In the case of the "Beware of False Prophets" ad, an addendum paragraph was added at the end of the ad-copy when the version 3 Prophet-5 was released. In this Prophet-10 ad, the text "NOW SHOWING! See Your Local Dealer!" was added much later in the roughly nine-month ad-run. Looking back, as far as I can tell the last time the Prophet-10 was featured in a CK ad was way back in 1978 when the first Prophet ad appeared. Back then, the 'version 1' Prophet-10 was just a single keyboard instrument. 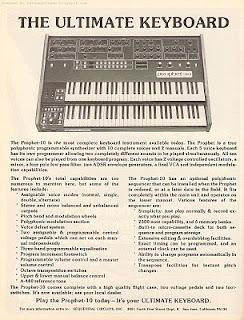 Then, according to Synthmuseum.com's Prophet-10 page, the double-manual keyboard version of the Prophet-10 was "once again attempted in 1979". That same synthmuseum page tells us that the 'version 3' Prophet-10 was released in 1980. 1. This ad started showing up at the beginning of 1980 as a delayed response to the introduction of the version 2 Prophet-10, and then the "now showing" text was added when version 3 came out. 2. 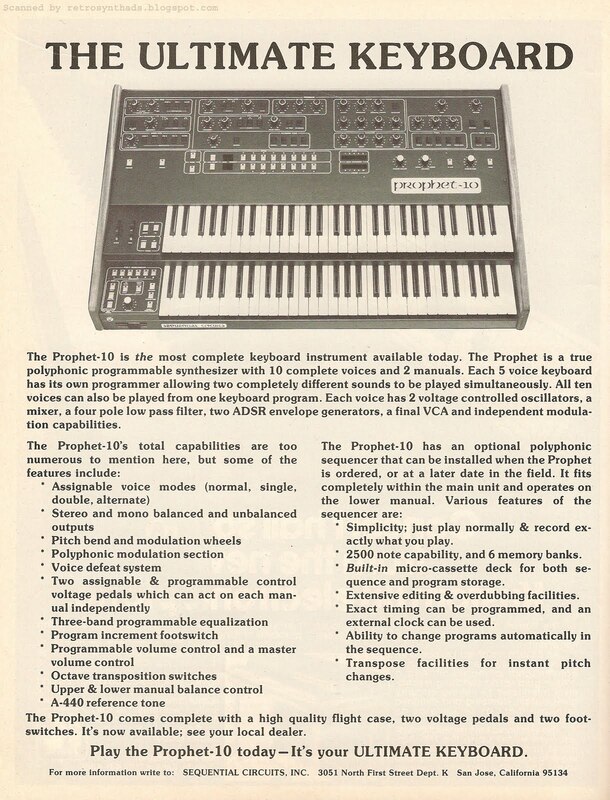 This ad started showing up a a teaser for the version 3 Prophet-10, and "now showing" was added to the ad when the new version started showing up at local dealers. 3. There is no correlation. Which I doubt considering SCI's previous strategic marketing efforts. "Sick, sick, sick. No one else had the balls to take their flagship synth (p5) and graft two together to make such a beast (imagine a Jupiter 16). One of the most over the top and wonderful analog instruments ever." Well, maybe the Oberheim Eight-Voice. That was ballsy too - but not technically two Four-Voices grafted together. So, Mezzo is probably right. End note: This ad also has something else in common with the previous ads that included Mattos' artwork - and it is probably one of my favorite features of this ad. Humor. Look closely in the bottom right hand corner and you will see a poodle doing it's "business" on tux-guy's leg. On holidays until January 17. But will be back then with more great ads and commentary. And no. I'm not on a beach. But in my mind I am.